Major study on use of embodied carbon measurement in buildings worldwide. The Embodied Carbon Review reports the results of how embodied carbon, that is, the carbon emissions from construction materials, is addressed in certifications and regulations globally. 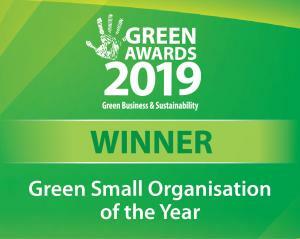 This research was conducted by Bionova Ltd (One Click LCA) and sponsored by Saint-Gobain, Stora Enso, Finnish Ministry of the Environment and the Finnish Transport Agency. Embodied carbon has a short-term climate impact. If energy grids decarbonize, the embodied carbon from new buildings may remain the higher long-term emissions driver as well. As buildings become more energy-efficient and use more renewable energy sources, the proportional share of embodied carbon grows. This review analyzed environmental sustainability certifications and regulations applied to construction works used at least regionally. The study identified 156 such systems, of which 105 include measures addressing embodied carbon directly. National systems were identified in 26 countries. Embodied carbon is addressed with methods of different carbon reduction efficiency, including carbon reporting, comparison in design, carbon rating, carbon caps, and mandatory offsetting. Embodied carbon reduction methods also vary in the ways the performance is rated, and if low-carbon product selection is included as a complementary measure. Results are reported and analyzed for five global regions, in addition with all internationally used systems and civil engineering works-targeting systems analyzed separately. Regions differ significantly in terms of prevalence of embodied carbon targeting, as well as the level of sophistication for its reduction. The report concludes with an explanation of the identified best practices for embodied carbon reduction, highlighting of the successful cases of embodied carbon reduction in certification, regulation, and infrastructure, as well as an outlook for embodied carbon reduction in the future. 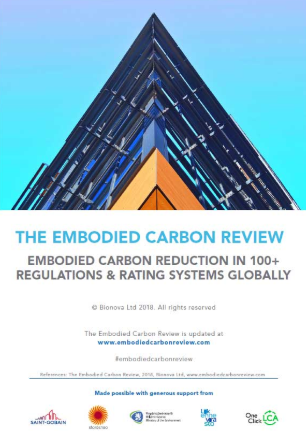 The Embodied Carbon Review is planned to be updated from time to time. Updates will be available on www.embodiedcarbonreview.com or at www.oneclicklca.com/embodied-carbon-review.